Low key drama fueled by solid performances. On a remote, desolate island off the British coast, a community lives a hand to mouth existence, celebrating when passing yachts come to grief so they can scavenge the wood. They celebrate more when a pod of narwhales are beached, knowing they can eat in style for weeks. As the islanders ready themselves to butcher the whales, an elderly hermit appears to warn of danger if the whales are harmed, remembering an earlier time when the slaughter of a pod of stranded whales was followed by disaster. Good performances all round, led by Paul Scofield and Helen Mirren. 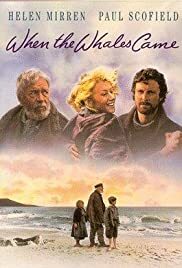 This is certainly not a film to get your adrenalin going but "When the Whales Came" is worthy of a viewing; for the acting, the scenery and the whales.